Today the New York City Council heard testimony from a deputy mayor and members of the public on how to reform the city’s opaque land-use rules that govern changes to deed restrictions. Hours of questioning and public testimony at the Committee on Governmental Operations and the Committee on Oversight and Investigations’ joint hearing on reforms to the deed modification process teased out a few key threads in the debate: misdeeds behind Rivington House deal, reforms for inter-agency communication, and which, if any, deed modifications should be subject to a standardized public review process. For nearly three hours, council members grilled First Deputy Mayor Anthony Shorris on what went wrong at Rivington House, where the city’s lifting of the site’s deed restrictions cleared the way for a private entity to sell the property for $116 million. Council members also spoke on a proposed bill that seeks to subject all deed modifications to a Uniform Land Use Review Process (ULURP). Intro 1182 sponsor and New York City Council Member Margaret Chin, whose district includes Rivington House (and 28 Liberty), was joined by colleagues Rosie Mendez, Mark Levine, Brad Lander, Ben Kallos, Vincent Gentile, Helen Rosenthal, and Joseph Borelli on a bill that would require the mayor to keep an online, searchable database of properties with deed restrictions that the city exchanged, sold, or otherwise transferred. These deeds must have been created by or on behalf of the city. Furthermore, the bill would require the mayor to give 60 days notice if a deed restriction is modified or removed. At the same time, the borough president, council member, and community board where the property is located would be notified, and a public hearing would be held within 30 days of the removal or modification. A dossier with public documents that contain information on the property, would be available to the public at the community board’s office. For Shorris, the land use and deed issue at Rivington House are separate problems that require separate responses. As the law stands now, each agency has different in-house processes for resolving requests to modify or lift deed restrictions (restrictions can also be altered between private entities). Shorris argued that, under normal circumstances and in most cases, deed restriction modifications are minor modifications and don’t make it onto City Hall’s radar, but agreed with some council members’ position that reforms should make the process more transparent. There’s no consensus yet on how the city will distinguish modest requests from major ones. In its testimony to the council today, the Municipal Art Society (MAS) stated that there are 14 properties in the city with pending deed modifications, with almost half of these coming from LLCs, so the identities—and intentions—of the owners are unknown. The difference between minor and not-so-minor modifications is one that has surfaced in discussions around the proposed deed modification at 28 Liberty, the landmarked modernist building where a developer is trying to modify the deed restriction to build three glass pavilions. 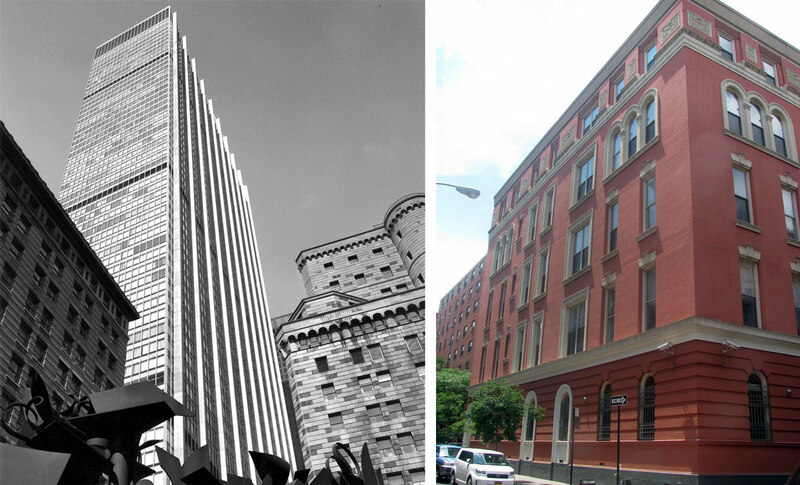 The organization’s testimony drew parallels between the potential environmental impact of the lifted deed at Rivington House and the proposed modification of the deed at 28 Liberty, which, MAS says, would impact the landmarked building and alter viewsheds across its plaza. MAS supports Intro 1182 overall, but advocates for adding an environmental review component to the bill to aid its goal of a more transparent deed modification process. While supporting Brewer and Chin’s desire for deed modifications on city-owned property to a ULURP, MAS would like to see a City Environmental Quality Review (CEQR) for modifications or removals to see if the changes would negatively affect the environment. For its part, the city is looking to create a parallel, not a uniform, procedure for each agency. “We need that for DCAS, that’s part of the changes we proposed,” Shorris said. The mayor’s office and DCAS will continue the conversation in a series of public meetings on the proposed reforms on November 1.